The 78th Precinct in Brooklyn is one NYPD outpost that seems fairly responsive to community concerns about dangerous streets. Deputy Inspector Michael Ameri has a reputation for paying attention to pedestrian and cyclist safety — he was the commanding officer who decided that a guerrilla bike lane on one block of Bergen Street deserved to stay in place. 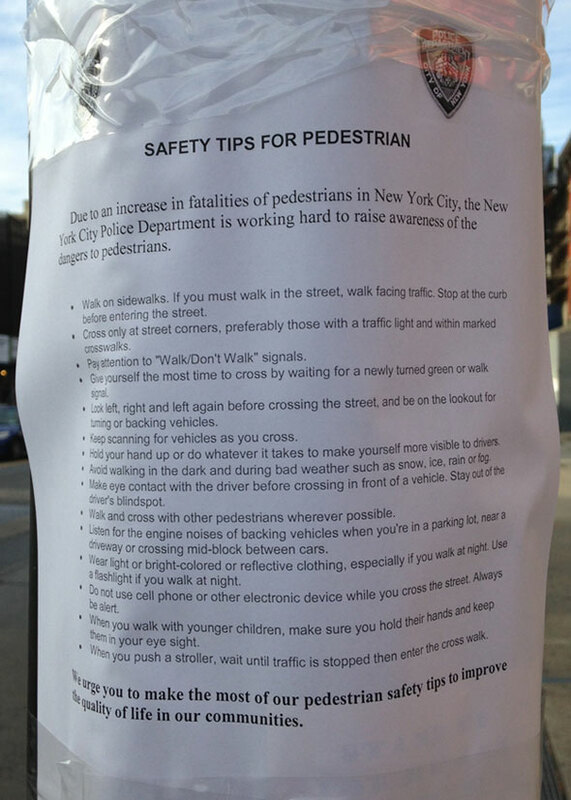 But this “safety tips for pedestrian” flyer recently spotted near Flatbush Avenue in the 78th is about as unhelpful and tone-deaf as you can get. On an almost daily basis, lately, New Yorkers are getting maimed and killed by reckless drivers who crash into sidewalks. And yet, this public education campaign from NYPD seems to consist primarily of tsking pedestrians and reminding people to carry flashlights and wear bright colors when it’s dark — which, right now, is any time after 4:30 in the afternoon. Got it… to “improve the quality of life,” you’ve got to walk around your own neighborhood in constant fear. Great message. I put in queries with NYPD’s press office and the 78th Precinct community affairs desk to see if these tips came from police headquarters or if they’re just a local initiative. No response yet. Update: The 78th Precinct’s community affairs desk called back to say that this flyer is boilerplate that came from 1 Police Plaza. NYPD headquarters sent it out, and the local precinct put it up. According to the city’s 2010 pedestrian safety study, driver error is the main cause of nearly four out of every five serious pedestrian injuries. The 78th Precinct issued zero speeding tickets and three tickets for failure to yield to pedestrians in September [PDF]. We’ve received no reports of flyers posted at gas stations or on windshields, reminding drivers to obey the speed limit, yield to pedestrians, and refrain from driving distracted. That would involve them walking, and not sitting in their patrol cars, texting or browsing the internet. You forgot “in broad daylight”. You can ask DontDent MyCar when you see him walking on the street. He’ll be the one wearing a neon wind suit with reflector bands on his arms and ankles. He’ll also be carrying a big flashlight. Just don’t look for him when it’s rainy/snowy/icy/foggy. He’ll be driving his car then because that’s much safer than walking in bad weather. I really don’t get why this flyer is so offensive. It says pay attention, make sure others see you, and try to make yourself more visible. Just today I saw a guy with headphones staring at the asphalt step out in front of a bus, against the light. The bus stopped, luckily, but, come on, at least look up before stepping out into traffic. Paying attention is fine. What is over the top is the expectation that people either refrain from walking at night or carry flashlights (WTF?) in order not to be killed on the street. Ridiculous. One should not have to wear bright clothing to avoid being killed. Where is the equivalent sign for drivers? You should NEVER make contact with the driver before crossing. They will take this as permission to go first over your right of way, or even take is as aggression or a challenge. You shouldn’t need a tactical flashlight to navigate the sidewalks at night. Drivers need to take responsibility for driving sanely. I really hope that is satire. The sheer idiocy of that comment /must/ be a failed attempt @ humour. oh wait… my sarcasm detector is malfunctioning again. Whoops! Mocking me? Have you always been a bully? Exactly. That’s basically victim-blaming. Because by posting that, if someone does get hit, then the media can ask the question or if it goes to court “Did they wear bright clothing?” It sets precedent. Being a pedestrian or cyclist among traffic (I am both daily) requires just the right mix of fear, paranoia, and aggression. Fear because, hey, cars kill people. Every day. Paranoia because many motorists drive like entitled psychopaths with little regard for human life and the damage their vehicle can cause. Aggression because, on the bike, if you cower in the gutter then cars will try to pass even when there is clearly not enough space to give you 2-3 feet clearance. Speeding and reckless driving are unlawful, and It would be just dandy if drivers drove with care, but they don’t. I prefer to be proactive and take some simple steps when on the road as a ped or cyclist. Avoidance is best (i.e. cross at crossings, always scan for oncoming cars, etc), but behaving in a defensive manner gets the job done, too. Why not right again too? This flyer doesn’t go far enough. What about up and down? Yes. And behind. You never know which direction a car can be coming from. exercise. We would be healthier if we replace our driving trips with enough walking or cycling to meet our exercise recommendations. It will save a lot of gas. While waiting at crosswalks, flashlights may get the attention of drivers. It’s easier to make eye contact. Drivers are supposed to stop. We should look for turning cars too. You never know if they will do a high speed turn. I’ve had to step back. On the two occasions, they were shortly after the walking signal turned on. Bright paint. Darker cars are harder to see. I would like to bring attention to the hazardous conditions on the South side of Canal Street beside the Holland Tunnel between Hudson and Varick Streets. If ever there was a street that needed bollards, this is it. I feel that it is an accident waiting to happen the way the cars and trucks zoom along. There is hardly a differentiation between roadway and sidewalk in some areas. Over the years, I have seen evidence of numerous vehicular accidents along this stretch. I see car parts, signs down and sometimes bits of clothing and shoes. I would hate to see a similar scenario occur like the one on West Street on October 31, 2017.